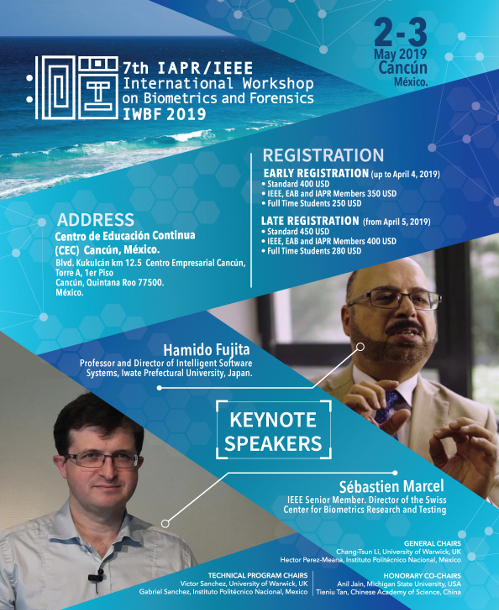 The 7th IAPR/IEEE International Workshop on Biometrics and Forensics (IWBF 2019) is organized by the EU Horizon-2020 IDENTITY Project and will be hosted by Instituto Politecnico Nacional, Mexico (IPN) in Cancun, Mexico, on May 2-3, 2019. IWBF is the premier international forum for research in the design and application of advanced biometric technologies for forensic science. IWBF is specifically devoted to facilitating synergies in research and development in the areas of multimedia forensics, forensic biometrics, and forensic science. State-of-the-art research in areas such as biometrics, forensic science, surveillance, and multimedia forensics will be presented. IWBF provides the meeting place for those concerned with the use of advanced biometric technologies in forensic applications, attracting participants from industry, research, academia, and end-users. 03/03/2019 Notifications to all authors have been emailed. Congratulations to the accepted papers. 18/01/2019 Registration fees are now published. The registration system will open soon.